A naked man who chewed off the face of another man in what is being called a zombie-like attack may have been under the influence of "bath salts," a drug referred to as the new LSD, according to reports from CNN affiliates in Miami. The horrific attack occurred Saturday and was only stopped after a police officer shot the attacker several times, killing him. Larry Vega witnessed the attack on Miami's MacArthur Causeway. He told CNN affiliate WSVN he saw one naked man chewing off the face of another naked man. "The guy was like tearing him to pieces with his mouth, so I told him, 'Get off!'" Vega told WSVN. "You know it's like the guy just kept eating the other guy away, like ripping his skin." "It was just a blob of blood," WSVN quoted Vega as saying. "You couldn't really see, it was just blood all over the place." Vega said he flagged down a passing police officer. "When the officer approached him, told him to stop, pointed a gun at him, he turned around and growled like a wild animal and kept eating at the man's face," Fraternal Order of Police President Armando Aguilar told CNN affiliate WPLG. 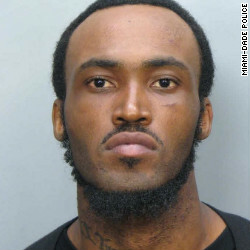 The attacker was identified by Miami-Dade Police as 31-year-old Rudy Eugene. Miami-Dade referred CNN to Miami Police for all other details of the investigation. Augilar said he suspects the attacker was under the influence of "bath salts." Four other drug use instances in Miami-Dade bear resemblances to Saturday's attack, he told WPLG. "It causes them to go completely insane and become very violent" and take off their clothes, Augilar told WPLG. Dr. Paul Adams, an emergency room physician at Jackson Memorial Hospital in Miami, told CNN affiliate WFOR that the drug makes users delirious. They exhibit elevated temperatures and extreme physical strength, Adams said. Adams said users have been known to use their jaws as weapons, according to WFOR. According to a 2011 report from the National Institute of Drug Abuse, bath salts contain amphetamine-like chemicals. "Doctors and clinicians at U.S. poison centers have indicated that ingesting or snorting 'bath salts' containing synthetic stimulants can cause chest pains, increased blood pressure, increased heart rate, agitation, hallucinations, extreme paranoia, and delusions," according to the NIDA report. In October, the Drug Enforcement Administration made possession of the stimulants in bath salts, Mephedrone, 3,4 methylenedioxypyrovalerone (MDPV) and Methylone, illegal under an emergency order. The order lasts for a year with a possible six-month extension. The stimulants have been placed under restrictions or banned in 37 states, according to a DEA press release. The victim of Saturday's attack, whom police have not identified, was in critical condition at Jackson Memorial on Monday, according to the WPLG report. Augilar told WPLG that 75% to 80% of his face was missing. Eugene had an arrest record, mostly misdemeanors, including a battery charge from when he was 16 that was later dropped, according to the Miami Herald. He had been married but divorced in 2007, WPLG reported. His former wife told the station that Eugene had been violent toward her. Homeless people near where the attack took place said Eugene was often seen around the area looking confused, according to WPLG. You cannot just assume that all phycotic crimes are drug oriented. Bath salts are for bathing and keeping your skin clear and soft. It is not meant for human consumtion in anyway. I blame over zealous individuals that advertise that bath salts can be used as a narcotic for these incidences. May have been on bath salts does not represent facts. Newspersons should stick to the facts and keep thier assumptions out of the news. Bath-salts were not the case, It was stated in the autopsy that the male was not on any medication. Which would include the synthesized drug "Bath Salts"
Valuable writing! Quite a bit a lot more webmasters had the primary perusing. I hope to share a fantastic deal much more of the stuff. In my opinion , you might amazing awareness with each other with concept. My small business is really galvanized this certain resources. hey there and thank you for the data – I have definitely picked up anything new from appropriate right here. I did having said that knowledge a few technical challenges using this web site, as I skilled to reload the website many times preceding to I could get it to load accurately. I had been questioning in case your internet host is OK? Not that I’m complaining, but slow loading instances instances will from time to time impact your placement in google and could harm your high quality score if marketing and promoting with Adwords. Nicely I am adding this RSS to my e-mail and can look out for a great deal a lot more of the respective fascinating content. Make certain which you update this once again soon.. Always an very informational post. You make some of the best posts. I love it another very great informational post. Your posts never disappoint me.